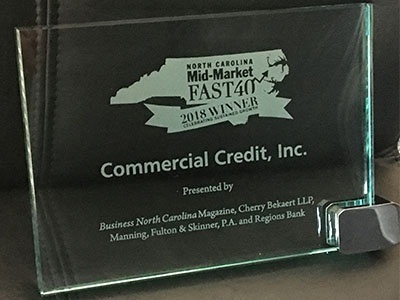 CHARLOTTE, NC (October 15, 2018) – Equipment and accounts receivable finance company, Commercial Credit, Inc., parent company of Commercial Credit Group Inc. and Commercial Funding Inc. has made the Business North Carolina Mid-Market Fast 40 List for the seventh year in a row. To qualify for the list, a company must be headquartered in North Carolina, have annual revenue between $10 and $500 million and demonstrate sustained revenue and employment growth over the past three years. The forty companies were recognized at a luncheon, hosted by Business North Carolina and Cherry Bekaert LLP, on October 10, 2018, and will be featured in the November issue of Business North Carolina magazine.